The Money Flow Oscillator (MFO) created by Vitali Apirine measures buying and selling pressure over a specific lookback. Bullish divergence indicates less selling pressure and bearish divergence indicates less buying pressure. Signals can be generated by looking for divergences of MFO with price and centerline crossovers. For our example code, we will combine both ideas into a counter-trend long-only trading system. To identify divergences between price and oscillator, we'll be applying a straightforward approach. A divergence is detected when the SRSI indicator fails to confirm a price extreme, that is, the highest high of 20 days for bearish divergence or the 20-day lowest low for bullish divergence. This technique improves divergence detection time, practically reducing delay to a minimum compared to finding retracements from recent peaks or troughs. Trades from the short side are deliberately not taken as their performance seems poor. Figure 1. 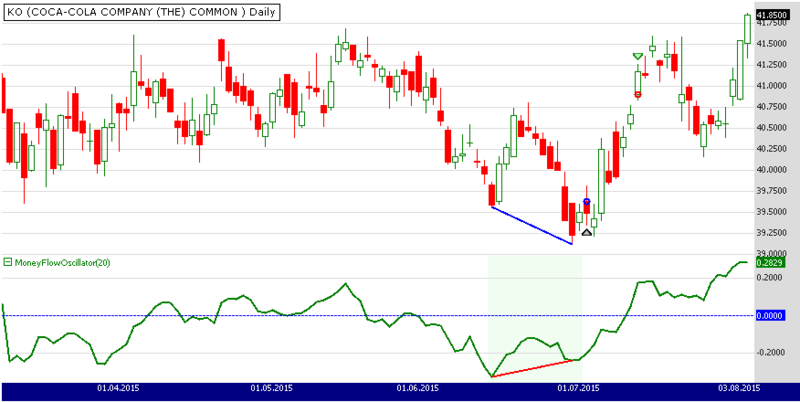 Bullish divergence between the MFO and price formed in June 2015 triggered a long trade in KO (Coca Cola). After updating the TASCIndicators library to v2015.09 or later, the MoneyFlowOscillator indicator can be found under the TASC Magazine Indicators group. You can plot it on a chart or use it as an entry or exit condition in a Rule-based Strategy without having to program a line of code yourself.